This is the fifth performance since 2004 you may be able to access of the first Ring opera under Simon Rattle – although the first to be made commercially available. (The previous ones – two with the OAE and two with the Berlin Philharmonic – may be found online or on a private Deutsche Bank release.) It is also by some way the most penetrating and successfully realised. By the clock his reading has become faster, perhaps almost inevitable in concert opera; but, significantly, it is mainly a question of weighting. Rather than luxuriating in the sonorities of the Berliners in this music – sounds that prompted some surprised comparisons with Karajan – the conductor now rediscovers in abundance the rhythmic energy and sheer enjoyment of the orchestration apparent in his reading from those first OAE concerts. This is married to an increased understanding – and use in the playing – of the dark irony, wit and even occasionally tragedy of the drama. The Bavarians are in tune with the approach (and there’s significantly more colour and character here than in their late-1980s recording for Haitink – EMI, 12/89) and also manage to surf over that slight dip in stamina that any orchestra must feel ‘live’ after descending to Nibelheim for scene 3 with a good half of the opera still to accomplish. Rattle’s cast (apart from Fasolt) has inevitably changed over the years and tends now to feature strong vocal actors evidently encouraged by their maestro. Michael Volle – who, like Tomasz Konieczny’s Alberich (Rattle’s Wotan this year in Vienna), does a fair amount of swapping between Wagnerian goodies and baddies – nails Wotan’s self-interest and short-sightedness from the beginning. He lacks the last ounce of bass depth to the voice but it’s already a compelling character. Konieczny is now a little too noble to be sheerly frightening in the two curses – and is allowed to laugh too much. Annette Dasch – already an established Elsa and Eva – counts as luxury casting as Freia and is genuinely sensual in her distress, so much more than just a dizzy flapper. Loge’s music is rightfully swift and well taken without mannerism by the experienced Burkhard Ulrich. Both he and the giants are given useful musical space to enjoy their texts and conflicting emotions. The sound from Munich’s Herkulessaal is crystal clear, the balance of the voices almost ideal. Rattle and the orchestra’s percussionists make sure that we never feel cheated of special sound effects, concert or not. Hugely recommended – and would make a good modern companion to the historic 1950s Bayreuth broadcasts under Krauss (Pristine, 6/04R) and Keilberth (Testament, 1/07). The Thielemann performances from Bayreuth (Opus Arte, 1/10) and Vienna (DG) are finely conducted but their casts are not so well attuned as this one. Simon Rattle has chalked up substantial Ring experience in recent years, at Baden, Aix-en-Provence, Vienna and elsewhere; but this performance is surprisingly different. His conducting is fast, as Wagner preferred and intensely dynamic but he avoids Boulez’s glibness, illuminating the drama of the moment in a mercurial, almost Solti-like fashion. If this sometimes occasions some choppy phrasing, it’s more than made up for by the translucent lustre of the Bavarian playing, the brass especially. This issue prompts an intriguing question: is this the beginning of a Rattle Ring cycle on disc? We don’t yet know, but I do hope that it is, as this would certainly be an auspicious start. For this recording, made at a concert in Munich’s Herkulessaal, Sir Simon has chosen his cast with great care. Most of the singers are quite young, so that instead of the heavy, cavernous voices we often hear in Wagner, we have clarity and incisiveness. Particularly interesting is his choice of Michael Volle for Wotan; Volle’s vocal quality is certainly on the light side of what we are accustomed to in this role. He is better known both as a lieder singer and for parts such as Sachs in Meistersinger but he is, for me, a revelation, as he sings so musically. He avoids hectoring and exaggeration and projects his words with imagination and colour. The orchestral playing from the Bavarian Radio Symphony Orchestra is superb, and has been captured with the utmost clarity by producer Pauline Heister and her team. The most striking feature of this recording is Rattle’s pacing of the whole piece. He is careful to avoid the dangerous propensity for enormous ‘flat-spots’ in the drama, where nothing much seems to be happening for ages, until the next ‘big moment’ comes along. That shortcoming often affects, for example, the famous Solti Ring, although that cycle does get better and better in this respect as it goes along. Rattle’s young singers convey successfully the sense of the long inter-god conversations that take place, and pay careful attention to Wagner’s rhythmic notation. The result is much greater clarity and flow, the feeling of the story continually unfolding, not bumping from one place to another. Equally important is Rattle’s way with the numerous orchestral episodes, which, in addition to securing such fine playing, he characterises powerfully. Take one example, the descent into the underworld of Nibelheim by Loge and Wotan. The interlude between scenes 2 and 3 (CD1 trs 18–19) describes their downward journey, the various fateful musical motifs woven in a great crescendo, at the peak of which comes the deafening racket of the dwarves’ hammers as they work away in their sweat-shop breaks out. It’s thrilling, even if the hammers are more musically tuned than we are used to. All the singers are excellent; but for me the most outstanding is bass-baritone Tomasz Konieczny in the part of Alberich. He exudes evil at all times, whether in his mocking laughter when stealing the gold from the Rhinemaidens (CD1 tr 6), or in his merciless cruelty to Mime (CD1 tr 19), which brings a little comic relief, albeit of a sadistic nature. His great monologue in scene 3 (CD2 tr 2) beginning ‘Hieher! Dorthin!’ (‘Here! There!’) is stunning, all the strange twisted intervals of the vocal writing nailed with chilling precision. What of the female roles? Wagner doesn’t grant them the kind of opportunities the men get. The Rhinemaidens, however, are a fine trio, and sing well together rather trying to out-blast each other, as can happen. Annette Dasch and Elisabeth Kulman as Freia and Fricka sing with expressive intelligence but the greatest impact, in one of the key moments of the work, comes from the rich tones of Janina Baechle as Erda, who rises from the earth to deliver dire warnings to Wotan (CD2 tr 17). Are there any disappointments? Well, one or two; Donner’s great solo as he strikes his hammer on a rock, ‘Heda! Heda! Hedo!’ (CD2 tr 21) lacks the visceral thrill I’d hoped for, and seemed a little tame. Shortly afterwards, as the orchestra, complete with six harps, evokes the rainbow bridge to the newly-built Valhalla, Michael Volle and his conductor have a momentary disagreement or misunderstanding about the tempo. That sorts itself out in a trice, however, and the build-up to the conclusion – The Gods’ Entry into Valhalla – proceeds with magnificence, interrupted only by the lamenting Rhinemaidens down in the Rhine. However, Rattle manages to convey a certain provisional quality to the affirmation of this ending – there’s plenty still to come. This recording certainly comes with a high recommendation; the way Rattle preserves the forward movement of both music and drama makes it, in my view, superior to fine recent versions by Janowski (on Pentatone), Levine (on Deutsche Grammophon), and Gergiev (on Mariinsky). More please. LISTENING TO THESE two fine recordings renewed my awe at the scope of Wagner’s achievement. Das Rheingold is a political drama of Shakespearean intensity—opera’s Julius Caesar, the shifts in power between gods, giants, dwarves and water nymphs rendered in sharply dramatic terms. No other Wagner opera has less fat; the piece moves inexorably from the depths of the Rhine to the entrance into Valhalla. And for all of the composer’s stated contempt for “grand opera,” no nineteenth-century finale is more majestically proportioned or provides a greater occasion for scenic splendor than that of Rheingold. Both sets derive from 2015 concert performances. The Simon Rattle set on BR Klassik is the more orthodox of the two, the more conventionally “Wagnerian,” featuring the work of a great, to-the-manner-born German orchestra. The conductor’s mastery of orchestral texture is in bountiful evidence, beautifully captured by BR’s engineers. The BRSO strings play with wonderfully lush tone; the brass is never blatant, always sumptuous and enveloping. For all its opulence, the orchestral sound remains transparent, acting as a cushion rather than a hurdle for the singers. Rattle takes a buoyant approach to the score; the whole performance conveys an irresistible delight in Wagner’s invention. The orchestra is considerably more recessed on Jaap van Zweden’s Naxos set. The strings in particular are sometimes more felt than heard; figurations that are sharply articulated in other recordings here emerge as an evocative wash of sound. The Hong Kong band is clearly top-notch—just listen to the finely manicured playing of the brass at the first appearance of the Walhalla theme—but van Zweden seems not to see Rheingold as an orchestral showpiece. For all the expressiveness of Wagner’s orchestral continuity, in this performance it’s the singers who carry the drama forward. The reading is slower than Rattle’s—a full ten minutes longer. Van Zweden particularly takes his time in the opening scene: the currents of the Rhine don’t exactly rush here, and the maidens have clearly traded their swimwear for concert garb. But the conductor’s deliberateness pays off once the gods enter: their political machinations unfold with unerring logic, and he gets the scherzo-like nature of the Nibelheim confrontation exactly right. Both sets are well cast, with complementary strengths and weaknesses. Tomasz Konieczny, BR’s Alberich, has the fuller, rounder tone; Peter Sidhom, on Naxos, offers more grotesquerie: if Konieczny’s Alberich is Wotan’s dark alter ego, Sidhom is Mime’s stronger brother. Neither Loge—Kim Begley (Naxos), Burkhard Ulrich (BR)—has a voice that lands gently on the ear, but both offer accomplished portrayals. Begley’s is the authoritative work of a veteran character tenor; Ulrich’s tone is, if anything, more astringent, but his vivid articulation of the music’s rhythmic values makes tangible the fire god’s quicksilver intelligence. The hint of plangency in Herwig Pecoraro’s voice (BR) suggests that Mime is at least capable of a kind of human suffering; David Cangelosi’s tone (Naxos) is unremittingly harsh—a defensible approach, considering the ugliness of the character. Elizabeth Kulman (BR) is a lyrical, womanly Fricka, still plausibly the seductress when she goads Wotan to steal the Rhinemaidens’ horde. Michelle DeYoung (Naxos) lashes out at her husband with gutsy, incisive chest tones, but her top is here too disorganized to sustain a true legato. The Freias on both sets—Annette Dasch (BR) and Anna Samuil (Naxos)—sound like amped-up lyric sopranos rather than jugendlich Wagnerians. Both convincingly convey the goddess’s distress; Dasch’s tone is marginally fuller. BR has the better Donner and Froh in Christian Van Horn and Benjamin Bruns, both of them exhibiting fresh lyric voices; Oleksandr Pushniak and Charles Reid (Naxos) seem to have neglected to partake of the apples of youth. Both pairs of giants are well matched. Peter Rose (BR) is an unusually light-voiced Fasolt, sounding closer to a bass-baritone than a basso profundo; as his brother, Eric Halfvarson, with his dark voice, makes for an effective contrast, although at times I wished he would sing more securely through the center of the tone. On the Naxos set, Kwangchul Youn’s top exhibits an incipient wobble, but the forward thrust of his tone works especially well in Fasolt’s lawyerly disputations. The inkiness of Stephen Milling’s voice makes him an ideal Fafner—the tone itself offers a glimpse of evil. Which brings us to the opera’s central figure. The BR set features the solid, commendable Wotan of Michael Volle. His tone is not particularly distinctive or attractive: it’s a little gruff, with a hint of “Bayreuth bark.” Still, Volle has the measure of the role, and he sharply delineates the god’s shifts in temper. On the Naxos set, though, Matthias Goerne is a revelation. The warmth of his voice may be no surprise to anyone who has heard him sing lieder; what’s remarkable is how consistently he sustains the beauty of his tone throughout this strenuous assignment—a triumph of bel canto singing. The effect is to make Wotan less stern, more vulnerable than in a conventional portrayal; a human heart beats within his godly frame. In this performance, Goerne upholds the great tradition of Wagner singing. Mit seinem erst dritten Gastspiel beim Symphonieorchester des Bayerischen Rundfunks im April 2015 sorgte Sir Simon Rattle mit Wagners „Rheingold“ für einen späten Saisonhöhepunkt. Einfach alles stimmte: die Chemie zwischen dem Dirigenten und dem Orchester sowie die Sängerbesetzung. Mochte Wagner auch der Staatskapelle Dresden das schmeichelnde Attribut von der „Wunderharfe“ verliehen haben – an diesen beiden „Rheingold“-Abenden war es das Symphonieorchester des Bayerischen Rundfunks, welches sozusagen über sich hinaus wuchs und ungeahnte orchestrale Wunder und Wonnen vollbrachte. Von allem Anbeginn an zielt Rattles Dirigat in Richtung eines musikalischen Konversationsstücks. Und um die Klangrede im Fluss – und unter Spannung – zu halten, wählt er vergleichsweise vitale Tempi. Das lebt und webt im Orchester, funkelt und leuchtet bereits im Es-Dur-Vorspiel, wo die (Klang-)Farben des Rheins hundertfältig durch sonniges Licht gebrochen werden. Und man möchte betonen: des noch jungen Rheins, der sprudelt und schäumt, kristallklar rein und noch unbelastet von späteren Schadstoffen. Genau in diesem Ton setzten die drei Rheintöchter ein – ein stimmlich wie auch im Ausdruck vorbildlich aufeinander eingespieltes Nixentrio (kaum zu glauben, dass zwei von ihnen kurzfristig eingesprungen waren). Einen markanten Gegenpol dazu bietet Tomasz Konieczny als Alberich: Mit kraftvoller, machtgebietender Stimme windet und krümmt er sich sozusagen durch alle Stadien des an ihm begangenen Betrugs. Seine höhnische Entsagung der Liebe, seine desillusionierte Verfluchung des Rings sind – auch rein stimmlich – mitreißende Höhepunkte in dieser Aufführung. Aber genauso intensiv wirken dank Rattles magischer Gestaltung die vielen eher leisen, nachdenklichen, nach seelischer Innenschau ausgerichteten Stellen. Man staunt einmal mehr, wie viel im „Rheingold“ piano und pianissimo notiert ist – und wie faszinierend das sein kann. Unnachahmlich, wenn Wotan langsam aus seinen Träumen erwacht („Der Wonne seligen Saal“): Michael Volle intoniert das wie ein tagträumender Wanderer aus Schuberts Welten. Man hängt förmlich an seinen Lippen, versteht und genießt jedes Wort, kriegt jede durch Wortbedeutungen und Emotionen bedingte Schattierung seiner Stimme hautnah mit. Volles Wotan ist so ziemlich in allem das Gegenteil eines präpotenten Großmaules, obwohl er stimmlich durchaus ehrfurchtgebietend zulangen kann. Hört man ihn singen und sinnen, so spürt man zwischen den Zeilen und in Untertönen bereits jene Götterdämmerung, die zwei Theaterabende später sein Ende besiegeln wird. Großartig. Ebenso Elisabeth Kulman als Fricka – auch das eine Rollendarstellung, die sich Erfahrungen aus dem Liedgesang fruchtbar zunutze macht, ohne oberflächliches Gattinnen-Gekeife, denn sie ist (auch stimmlich) eine Frau in besten Jahren, wohlüberlegt und hochdifferenziert im Singen und Sagen. Überhaupt möchte man das Phrase für Phrase bedeutungsintensiv ausgewogene Miteinander von Singen und Sagen als Richtschnur dieser Aufführung bezeichnen. Auch Burkhard Ulrich (Loge) und Herwig Pecoraro (Mime) exzellieren in dieser musikdramatischen Kunst, sodass ihre große Auseinandersetzung mit Wotan in der dritten Szene zu einem echt theatralischen Höhepunkt gerät. Und das Orchester spielt hier derart pointiert und lustvoll mit, dass man bei mancher Stelle meint, Rattle schmunzeln zu sehen. Als Zuhörer fühlt man sich fast wie in einem Märchen. Auch Fafner und Fasolt, Froh und Donner haben echtes Märchenformat, alle mit prächtiger stimmlicher Darstellungslust. Zudem ist der Mitschnitt klangtechnisch überragend gelungen – einerseits mit einem großräumigen Klangbild, worin sich die Musik jederzeit frei entfalten und ausschwingen kann, und andererseits mit einer Präsenz der Sänger, die der Handlung gleichsam eine szenische Unmittelbarkeit verleiht. Was möchte man mehr? Dieser Münchner Konzertmitschnitt unter Sir Simon Rattle ist wohl eine der besten Aufnahmen vom ‘Rheingold’ in den letzten vierzig Jahren. Rattle entpuppt sich ab den ersten Minuten als waschechter Wagnerianer, dem es nicht auf orchestrale Pracht, sondern vielmehr auf dynamische Abstimmungen, lebendiges Musizieren und einen transparenten Klang mit enormer Durchhörbarkeit ankommt. Die Tempi sind relativ zügig. Gegenüber dem etwa zeitgleich veröffentlichen ‘Rheingold’ aus Hongkong unter Jaap van Zweden, besitzt Rattle die bessere Sängercrew und mit dem Symphonieorchester des Bayerischen Rundfunks auch das bessere Orchester. Michael Volle ist ein traumhafter Wotan und nach den eher unglücklichen Versuchen der letzten Jahre, mit Falk Struckmann und Albert Dohmen hochkarätige deutsche Wotan-Sänger aufzubauen, eine stimmliche und darstellerische Offenbarung. Volle knüpft mit seiner klugen Gestaltung und seinem heldischen Bariton an Vorgänger wie Theo Adam, Jerome Hines oder Hans Hotter an. Somit ist die Latte für die anderen Sänger bereits sehr hoch angelegt. Doch Volles Mitstreiter haben keine Probleme, auf diesem Niveau mitzuhalten. Zur Freude des Zuhörers gibt es in diesem ‘Rheingold’ keine einzige Schwachstelle und durchwegs nur guten bis hervorragenden Gesang. Besonders hervorheben muss man an dieser Stelle die beiden Tenöre Burkhard Ulrich als wendiger, verschlagener Loge und Benjamin Bruns als lyrisch-belcantonesker Froh. Thomas Konieczny singt einen der besten Alberichs der Plattengeschichte und besticht durch eine junge, frische und unverbrauchte Stimme. Elisabeth Kulman (Fricka), Annette Dasch (Freia) und Janina Baechle (Erda) sind alle drei hervorragend. Als Fasolt hören wir Peter Rose und als Fafner Eric Halfvarson, der unter Rattle erstaunlich genau und ‘schön’ singt. Auch die übrige Besetzung lässt keine Wünsche offen. Eigentlich muss man mit dem Orchester beginnen, um die Meriten dieser Live-Aufnahme vom 24. und 25. April 2015 aus dem Herkulessaal in München richtig würdigen zu können. Das Symphonieorchester des Bayerischen Rundfunks ist eines der besten Orchester der Welt, das weiß jeder. Aber was bei diesem quasi unter Studiobedingungen entstandenen Rheingold-Mitschnitt aus München orchestral in die Waagschale geworfen wird, lässt nicht nur Wagner-Herzen spontan jubeln. Streicher, Holz, edles Blech, alle stehen im unbedingten Dienste dieses witzigen kühnen Vorabends zu „Der Ring des Nibelungen“. 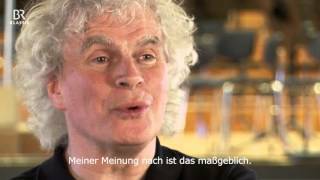 Und Sir Simon Rattle ist bei Rheingold in seinem ureigensten Element. Eher die strukturelle Modernität dieser Partitur betonend als schon jetzt hochromantisch aufzutrumpfen, ist seine Sache. Und das bekommt dem Rheingold bestens, zumal auch die Aufnahmezauberer der Bayerischen Rundfunks (Tonmeister Pauline Heister, Toningenieur Peter Urban) wahre Wunder vollbringen. Bei aller Prägnanz der Stimmen ist das Klangbild vollkommen klar, durchsichtig und mit dem Orchester bestens abgemischt. Eine Pioniertat und Trumpf moderner Aufnahmetechnik, so natürlich wurden Stimmen und ihre spezifischen Farbqualitäten selten eingefangen. Und ja die Sänger: Fast durchwegs eine Traumphalanx, die beinahe jeden Wunsch eingefleischter Wagnerianer Wirklichkeit werden lassen: Michael Volles männlich kerniger Wotan schließt nahtlos an George London an. Tomasz Konieczny ist in der Rolle des Alberich goldrichtig eingesetzt, sein leicht exotisch dunkel drängendes Timbre passt so richtig zum Nachtalben und Drahtzieher des Untergangs. Da stören auch so manche Vokalverfärbungen nicht so sehr. Unser Herwig Pacoraro aus der Wiener Staatsoper ist ein Mime, wie es besser nicht geht. Von Diktion, Witz, rezitativisch kluger Disposition bis Schönheit des Tons, nicht fehlt. Burkhard Ulrich bringt für die Partie des Loge nicht Edelklang ein, versöhnt aber mit einer dramaturgisch und in der Wortausdeutung beispielhaften Interpretation. Es tut der Gesamtdisposition äußerst gut, dass alle Stimmen unverwechselbar sind und so jede Rolle ein vokales Eigenprofil bekommt. Das gilt auch für die fabelhafte Frauenriege: Elisabeth Kulman als Fricka, Annette Dasch als Freia und Janina Baechle als Erda formen signifikante Charaktere aus ihren jeweils unverwechselbaren stimmlichen Mitteln. Besonders Elisabeth Kulman ist ein in jeder Hinsicht idealer Wagner-Mezzo: Ruhige Stimmführung, Luxusstimme, wohldosierte Artikulation. Hoffentlich steht sie – wenn schon nicht auf der Bühne – so doch noch oft für konzertante Opernaufführungen oder im Studio zur Verfügung. Pure Freude bereiten auch die Rheintöchter: Mirella Hagen als Woglinde, Stefanie Irányi als Wellgunde und Eva Vogel als Floßhilde. Die Männerriege rundet sich luxuriös mit Peter Rose (Faslot), Eric Halvarson (Fafner) und Benjamin Bruns (Froh). Die Partie des Donner (Christian Van Horn) hat man schon besser singen gehört. Das trübt aber die insgesamt herausragende Qualität und den fabelhaften Gesamteindruck dieser Neuerscheinung nicht.